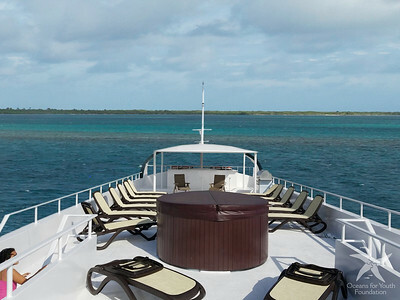 → 2019: CUBA Liveaboard July 6-13 Garden of the Queens PLUS Saltwater Crocs! #1 TRIP DEALS & DETAILS: CUBA JUL 6-13, 2019, CUBA!!!! Sharks & Saltwater Crocks! REMEMBER...ALL TRAVELERS NEED TO BE PREMIER MEMBERS OR ABOVE & HAVE DIVE INSURANCE TO JOIN OUR AMAZING TRIPS!!! **SPECIAL EARLY BOOKING REBATES APPLY TO THIS TRIP IF YOU SIGN UP BEFORE SEPT 29th or less if prior to Oct 29 or the least amount if by Nov 29th. SEE BELOW FOR FULL DETAILS AND HOW TO SIGN UP FOR THIS TRIP. IT IS ENTIRELY DIFFERENT FROM ANY TRIP WE'VE RUN. NOTE: Two cabins can be upgraded to a single room for 65% upcharge. The Master Suites are the same price as the Deluxe Suites but those signing up early will have a chance to win the Master Suites for free. 5 1/2 days of diving and conservation program with marine experts. DIVE Insurance- is MANDATORY! DIVE insurance is VERY inexpensive. Even if you have insurance that you think covers DIVING ACCIDENTS and air lifts…it is CHEAP to get a supplemental policy to ensure you are cared for. Please read the TRIP FAQ for this trip HERE. And follow this FAQ for ongoing trip updates and/or clarifications. When paying your deposit by the dates listed below TO OCEANS FOR YOUTH. You will not pay SingleDivers.com for this trip. When you make your final payment in full and attend the trip you will receive your rebate of up to $500 depending on the trip and discount level you qualifed for less any credit card fees charged by Aggressor for processing your payments if you paid using a card. Payment must be rec'd by Oceans for Youth by the deadline given.to qualify for your rebate savings. After the posted deadlines below you will fall into the next level or discount category if there is one. Only one (1) early booking savings can be used per person per trip. The other discounts below or incentives apply to anyone who signs up for them and/or qualifies. All trip goers MUST be Premier Members to receive a club REBATE/SAVINGS BACK after the final payment. is made or 89 days prior whichever is latter. Cash Discount: You need to pay with a PERSONAL CHECK to Oceans For Youth to save 3% credit card fees from your rebate/savings. Active Duty Military Discount: $25 OFF Active Duty Military Discount for any active duty military of any country that fights for freedom. Thank you for your service. (Please be prepared to provide proof of service in person at time of check in) - ON THIS TRIP ONLY WE WILL INCLUDE THIS WITH YOUR REBATE. SAVE $75 by submitting your Documents within 21 days of booking this trip. If booking within 45 days of the trip please submit your documents within 3 days. Otherwise the $75 document processing fee will be added to your final invoice. The Jardines Aggressor II is a 120’ yacht with a wide beam built and powered for comfort, safety and stability, is diesel-powered, cruises at 10 knots and has 110-volt power onboard. 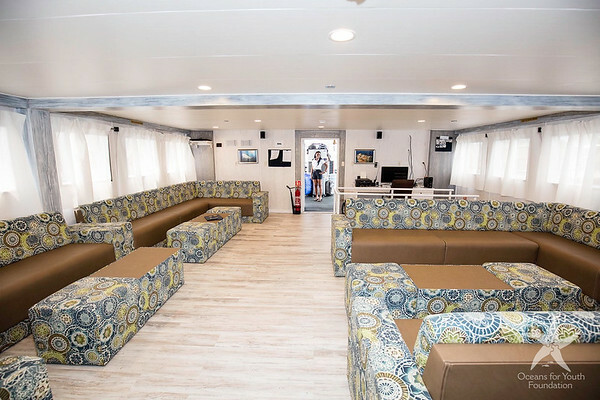 Accommodations on the Jardines Aggressor II includes two Balcony Suites, each having double side-by-side beds, ten Deluxe staterooms, each with single side-byside beds. Staterooms have a hairdryer, its own private bathroom with a toilet and shower and individual air conditioning climate controls. Linens are changed mid-week, by request, and fresh towels are placed in each stateroom as needed. The Jardines Aggressor II sleeps 24 guests in privacy and comfort and each has a roomy, air conditioned salon and dining area, sun deck complete with a hot tub, lounge and deck chairs, stereo and CD player (has an IPod plug-in), shaded wet bar and grill, a complete photo center with a digital video and still photo editing computer. 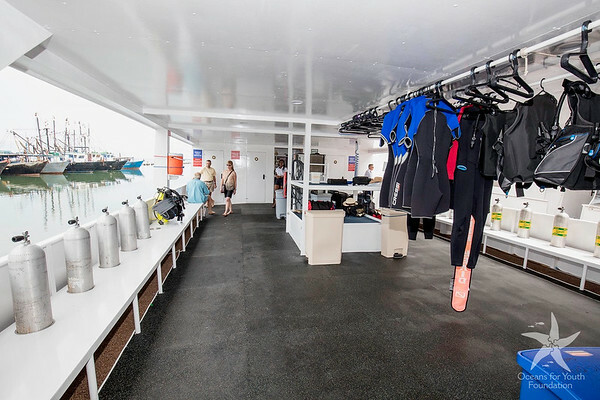 Diving amenities include Nitrox (must be prepaid), individual dive lockers, camera table with low-pressure air hoses, and two hot, fresh water showers. The yacht has a safe aboard to store valuables such as passports, cash, credit cards or anything else you would like to store. The yachts are not responsible for any lost, damaged or stolen items. We highly recommend extreme caution and care be taken if you plan to travel onboard with electronic equipment. This equipment should always be stowed after use to avoid the risk of damage. 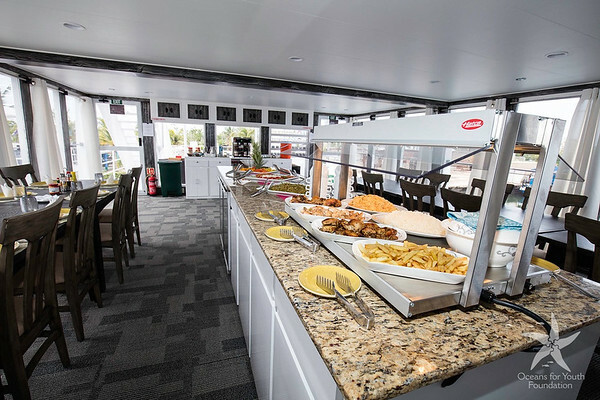 The menu aboard offers breakfast, (cooked to order), buffet lunch and an elegant meal at dinner with tableside service are served in addition to fresh mid-morning and mid-afternoon snacks. Beverages (alcoholic and non-alcoholic) are complimentary while onboard. Filled tanks, weights and weight belts are included. Both trips are EXACTLY THE SAME...going to Garden of the Queens,Saltwater Crocs & other cool sites, however the Jun 29-Jul6 trip has more spots on it for our group i.e 12. The Jul 6-13 trip is over half full and so we have only 8 spots on it. Unlike normal trips you ONLY HAVE TO MAKE THE DEPOSIT to hold your spot on this trip and of course make the progress payment TIMELY to Aggressor's Oceans for Youth. SD.com will track who's signed up, paid in full, and/or still need to complete things with OFYouth throughout the process to help you. $500 off,,...no that is not a typo... $500 off the trip price rebated at the end when paid in full.for doing Jul 6-13, 2019 Why? We had twice the spots for this trip and so its a supply and demand thing.... more spots = more savings but ONLY UNTIL Sept 29 ...HOWEVER we combined the trips and honored the BEST DISCOUNTS FOR EVERYONE!!! SEE SPECIAL BOOKING REQUIREMENTS AS THEY ARE TOTALLY DIFFERENT. Sign up wrong and you not only are NOT on the trip but you won't get the $500 or other rebate amounts back. Sign up and pay $1760 dep by Oct 29, 2018 VIA PERSONAL CHECK* to be mailed to and received by Oceans For Youth by Oct 29th and you will be eligible for a $300 rebate after taking the trip. Sign up and pay $1760 dep by Nov 29, 2018 VIA PERSONAL CHECK* to be mailed to and received by Oceans For Youth by Nov 29th and you will be eligible for a $200 rebate after taking the trip. Sign up and pay $1760 dep by Jan 29, 2019 VIA PERSONAL CHECK* to be mailed to and received by Oceans For Youth by Nov 29th and you will be eligible for a $100 rebate after taking the trip. * If it is too close to the deadline to mail a check to get signed up Aggressor will accept credit card payments for the trip but a 3% fee will be deducted from your otherwise applicable rebate. Progress Payment Due due 180 days prior. Final Payment & ALL OPTIONAL ADD-ONS DUE 90 days prior. Note: Trip must be paid in full 90 days prior to departure. Extras must also be paid in full 90 days prior i.e., Nitrox, park fees etc. Dep of $1760 needed to book your spot. Six (6) months out or 180 days prior to the trip or Dec 31st another $1760 is due. Three (3) months out or 90 days prior to the trip or Feb 28, 2019 FINAL PAYMENT IS DUE. The trip must be 100% paid in full including the nitrox and port and park fees. Once you have paid in full and traveled on the trip we will refund you the applicable savings/rebate you qualified for less any credit card fees (if you did not send in a check) via whichever payment method you prefer i.e. check, electronic deposit if you have banked with us before. The checks will be ready to send as soon as it is confirmed you made the trip. (We are working to actually refund at 90 days since you are not entitled any refund at that time vs waiting if at all possible. Ok so after several attempts to get people signed up with Aggessor we have standardized the booking process further and ITS MUCH SIMPLER!!! YEAH!!!! 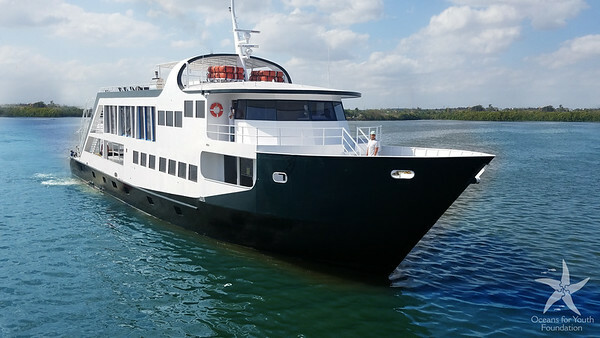 Our Trips Coordinator will email aggressor's MAIN YACHT FOR CUBA and give them the trip you want to be booked on along with your FULL LEGAL NAME, GENDER & PASSPORT COUNTRY OF ISSUANCE. This will then get you on the manifest for 7 days until they receive your check for $1760 WHICH YOU NEED TO MAKE OUT AND MAIL to Oceans For Youth 209 Hudson Trace, Augusta, GA 30907 within 7 days of signing up. Sometime after the 29th of Sept, SingleDivers.com will send you an electronic link to the Aggressor/Oceans For Youth Global Client Information System (GIS) and you can provide all your passport details, your cert levels, etc. Once you have mailed the check you should post HERE telling SingleDivers.com you have signed up for the trip and sent your money to Aggressor's Oceans for Youth. NOTE : If they do not receive your money you are not on the trip. You can check directly to see if they have rec'd your money by calling 706-993-2531 and asking for the CUBA YACHT and then telling them your name the CHARTER NUMBER of the trip you are on. #2950 For Jun 29-Jul 6 and #2951 for Jul 6-13. If your sign up goes past them receiving the money by Sept 29th you will only qualify for the next lower rebate. THE REBATE IS NOT MANAGED BY AGGRESSOR...instead it is managed by SingleDivers.com so pleases direct all questions regarding the rebate to trips@singledivers.com and we will get back to you as soon as we can. At any point in the process you NEED TO sign up for a $1 spot in the SingleDivers.com booking system. This is ONLY TO HELP MANAGE THE REBATE and ENABLE YOU TO FILL OUT OUR DOCUMENTS. The $1 will be refunded to you when we do the rebates and signing up in our system does NOT put you on the trip UNLESS YOU HAVE DONE THE FIRST PART BY MAILING YOUR CHECK TO OCEANS FOR YOUTH. Additionally it will give you an idea of who all is trying to get on the trip and ultimately who made it. If you sign up in our system and OFYouth does not receive your payment in 7 days we will cancel your spot so as to allow others to sign up. If you need to see if your money has arrived please CALL OCEANS FOR YOUTH to see if they have rec'd your money or not and reference the contract number and the date for the trip. SD.com will send a reminder around for the progress payment due 180 days out as well as the 90 day balance due in full payment. Late payments can cause the forfeit of your spot. Consider paying in full or early to avoid losing your spot. Buy TRIP INSURANCE from either Allianz and AG (both European companies) to cover your trip in the event of loss. (As far as we know these are the only companies that will ensure travelers to Cuba for TRIP INSURANCE. Get DIVE INSURANCE via www.DiveAssure.com They will cover diving related incidents. Once you are signed up have Aggressor email you a confirmation email and then forward that email to trips@singledivers.com putting CUBA the TRIP DATE and YOUR NAME in the subject line. We will use this to confirm you have a spot on the trip and add you to the official TRIP PM. SINGLEDIVERS.COM is doing the Gardens of the Queen (7 nights). Cancel 121 days or more prior to departure and 20% of the Cuba Travel Program is forfeited. Cancel 91-120 days prior to departure and 40% of the Cuba Travel Program is forfeited. Cancel 90 days or less prior to departure and 100% of the Cuba Travel Program is forfeited and no refunds will be given. SingleDivers.com provides its members with pricing that reflects all possible savings available including discounts from our over 10,000 member buying clout. We offer a CASH DISCOUNT that is always in BOLD RED LETTERS along with our regular pricing for easier comparison of all possible savings. The cash discount will be taken at the time of payment when you choose the "e-check" option. As you sign up for a trip you will add either the trip deposit amount or the full trip price to the shopping cart. You can also add any extras you wish to purchase but you will have to pay for them whenever you sign up for them. So if you are not ready to pay for nitrox now but want us to know you will be adding it to your order...please use the comment box to let us know ultimately what you are signing up for and any other special concerns you have or information you want us to know. Just understand we will not show you listed as doing something until it is paid for. When you are ready to pay for the extras you want you will click on the BOOK NOW button for the trip you are on and select the add-on(s) that you wish to pay for, add them to your cart and then check out. Depending on the trip you may need to click on the purple TAKE ME TO THE ADD-ON'S BOX. You will then either pay via e-check or credit card depending on whether you want a discount for cash or prefer the convenience of payment over time. When its time to make a progress payment you will click on MY TRIPS under TRIPS on the main menu. You will see "Make a Payment" under PAYMENTS in the upper right. Then choose what you are paying for and complete your payment. After each order you place with us you will receive an email order and payment confirmation. If you do not receive these TWO email confirmations (one showing the order at full price and one showing what was debited from your account including the cash discount) check in MY PAYMENTS to see if the payment was successful. If you do not see the payment in your My Trips then MAKE THE PAYMENT AGAIN. You will always get an order confirmation email every time you attempt an email but you will ONLY get a Payment Confirmation email when your payment was successful. If you need assistance please email . The MY PAYMENTS section is located under the PAYMENTS option found in the upper right of the MY TRIPS area of our site which is found under the TRIPS tab in the main menu. If International/ Non-US Clients and your credit card payment does not work, either use AA as the state and 12345 as the zip or please use our traditional written credit authorization form to submit your credit card payment. To receive this form click on SUBMIT HELP TICKET. Airport transfers on the charter arrival/departure day for arrivals include transfers to/from Santa Clara International Airport (SNU) or Camaguey International Airport (CMW). Upon arrival, a Cubatur representative in a yellow shirt will assist with luggage and the transfer. The bus will depart both airports at approximate 6:00 pm (approximately 3 hour ride). Visitors must have a current passport, adequate funds to support themselves, a return airline ticket and the verification letter from Oceans For Youth Foundation to travel to Cuba. Travelers must have a passport that is valid for 6 months from date of entry. It is the travelers’ responsibility to ensure they have the proper documentation to travel into each country on his or her itinerary as well as for re-entry and return to their country. Please check with the appropriate consulate to ensure you have the proper documentation. Always check your passport and visa requirements. US citizens may go to the US Department of State website at www.travel.state.gov for more information. The website also has information for consulates by country to assist with requirements. There are special requirements for children leaving the US and many countries have adopted requirements for the protection of children. Since regulations vary by country, contact your consulate or embassy of your country for the requirement. The Reservation Office and staff cannot assume responsibility for passengers not having correct documentation. TRIP INSURANCE IS OPTIONAL BUT STRONGLY SUGGESTED SINCE YOU CAN NOT SELL YOUR SPOT TO ANYONE ELSE. IF YOU CANCEL YOU LOSE YOUR MONEY. GET THE TRIP INSURANCE. If you choose to self-insure that is fine but you also choose to accept all losses accordingly as SD.com nor any vendors will be responsible for losses due to non-insurance. Allianz and AG (both European companies) AS THEY WILL ENSURE TRIPS TO CUBA. Jardines Aggressor II (Sat – Sat) Prior to arrival, you will be given an Immigration form. Since you are traveling on an Oceans For Youth Foundation, People to People program, please select ‘Foundation’. The 7-night Cuba Travel Program II begins on Saturday from the Camaguey or Santa Clara Airports. Guests arriving on flights by 6 pm will be greeted at the airport by a representative from Cubatur who will be wearing a yellow shirt; they will assist you with your luggage and transportation to the Jardines Aggressor II. Any arrivals before that time will need to wait for the transfer. Boarding is at 5 pm for travelers making their own way. Saturday Day 1 Welcome and pick-up at Camaguey Airport and Santa Clara Airport at 6 pm. Transfers to Jucaro are 3 hours for boarding the Jardines Aggressor II. Boarding is at 5 pm when making your own way to the yacht and dinner at 7 pm followed by the yacht briefing and a program on Cuba’s marine conservation programs. 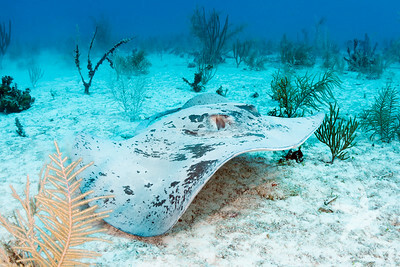 Sunday – Friday Day 2 - 6 Diving in the Gardens of the Queen and marine programs with Cuban biologists and experts. Saturday Departure Day 7 8 am Transfer to Camaguey or Santa Clara Airports (2 separate transfers) with lunch provided for 1 pm arrival. DIVE Insurance is required on all trips! DIVE insurance is VERY inexpensive. Even if you have insurance that you think covers DIVING ACCIDENTS and air lifts…it is CHEAP (approx $100-$125) to get a supplemental policy to ensure you are covered for an entire year of diving. PRO TIP; The two primary suppliers of dive insurance DiveAssure.com and DAN are inexpensive enough to carry both. This way you will have the best coverage internationally, the best coverage domestically, primary insurance, secondary insurance and if a claim is denied on one policy you can submit it on the other. No matter what happens...YOU ARE COVERED!!! ... PRICELESS!!! Minimum Certification / Experience: Diving is open to ALL levels of certification OW and up, at most experience levels. PRICES: Prices for classes in Paradise are always more expensive than doing them at home. Sometimes SingleDivers.com has instructors on our trips who are happy to teach AND usually offer a member discount to anyone interested in taking a class. The more that take a class the more feasible a discount becomes . Trip Insurance is STRONGLY SUGGESTED and/ is PRACTICALLY required on this trip! TRIP insurance is RELATIVELY inexpensive. Even if you have insurance that you think covers your trip…it is CHEAP (approx $100-$200) to get a supplemental policy to ensure you are covered for your investment in your dive trip. If you opt to not get trip insurance you are responsible for all losses related to your trip including not going for any reason. 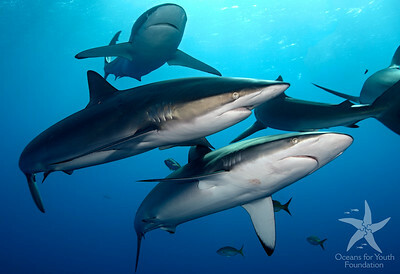 If diving a LIVEABOARD please consider the liveabaord rider offer by DiveAssure.com. DIVE Insurance is REQUIRED on this trip! DIVE insurance is RELATIVELY inexpensive. Even if you have insurance that you think covers you…it is CHEAP (approx $130) to get an annual policy to ensure you are covered. You can NOT opt out of DIVE INS. All SingleDivers.com trips require necessary documentation to facilitate booking your trip and/or making it a better experience for you. Once you complete your documents online our automated system will take the information from your last trip with us and fill out your new trip forms for you. You then add any missing information and/or change anything that is no longer current. You will find the forms you need to complete under MY TRIPS which you will find under TRIPS in the main menu across the top of the site. Since each trip requires a unique set of docs, please choose the correct trip from your "My Trips" drop down and then complete the forms required for that trip. Some trips will also ask you to complete the resort or liveaboard's forms as well. The AIR AUTHORIZATION FORM is only required when you are having SingleDivers.com book air for you but this includes air that is part of the trip pkg price. Not all of our forms are online as they are either infrequently used or being phased out. If you need a form that is not in our online directory, simply click on SUPPORT on the main menu and then click on SUBMIT HELP TICKET and choose TRIP ADMINISTRATION and ask for the form you need. You complete the necessary documentation as referenced above for each trip you sign up to take with us. A $75 document fee will be applied if you fail to submit your online and uploaded documents withing 21 days of signing up for a trip or within 3 days if signing up within 45 days of departure. You read the EXPERIENCE REQUIRED & TRAINING/WORKSHOPS information in the online trip details to ensure that you are able to safely and comfortably meet the requirements of the trip. Please contact to further discuss any questions you have about attending one of our trips. We often accept students who would not otherwise meet the stated trip requirements because they are taking a class that will then enable them to meet the trip specifications and they will be diving with an instructor or dive master during the dives. We require Dive Insurance for all dives and trips as stated above and we STRONGLY recommend trip insurance for all dives and trips but in some cases require it due to vendor specific mandates. Please see the online trip details under INSURANCE to see if the trip has optional or mandatory trip insurance requirements. In the event of cancellation, your trip insurance will be your first line of defense. Secondary remedies include some rights afforded to you based upon when you have to cancel your trip in writing. Please see THIS link for full additional trip cancellation details. Please read THIS link for our Guaranteed Double Occupancy Policy, Rooming Policies, Payment Terms, the "Ex" Rule etc. Edited by dive_sail_etc, 10 February 2019 - 04:23 PM. 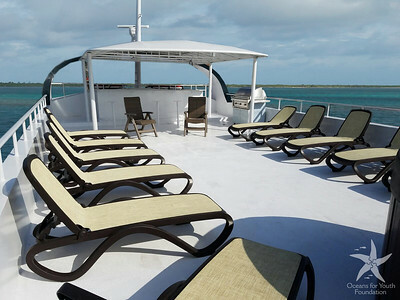 Back to 2019: CUBA Liveaboard July 6-13 Garden of the Queens PLUS Saltwater Crocs!